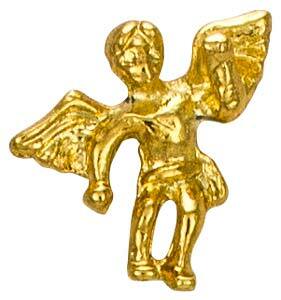 We manufacture and sell thousands of these popular 1/2 inch gold or silver angel on my shoulder pins. Quantity pricing! Silver $.25 additional each. Comes on an angel card individually bagged. Big Stock in gold. I am a retired Police Officer who now works in the Dispatch area. 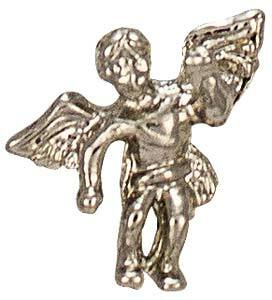 I have ordered maybe 30 or so of the Guardian Angel Pins from Church Suppliers and have given them to new Police Officers. I have made the Officers Promise me that they would wear the Angels on their uniforms, despite what beliefs they may have. Just a request from me. So far all of the pins are worn proudly. One Medic even cried when I gave him his. This is a dangerous world. Only GOD and his Angels can bring us through this. 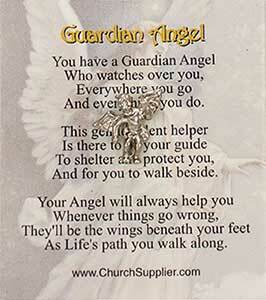 Thank You Church Suppliers for carrying the Guardian Angel Pins!! 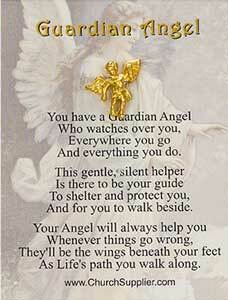 I gave an angel pin to each of students on the last day of school to represent protection over them. I was so happy they were delivered in time, thank you! They were well received.